Young neurons in the adult human brain are likely critical to its function. At a lab meeting of Fred “Rusty” Gage’s group at the Salk Institute for Biological Studies in the mid-1990s, the neuroscientist told his team that he wanted to determine whether new neurons are produced in the brains of adult humans. At the time, adult neurogenesis was well established in rodents, and there had been hints that primate brains also spawned new neurons later in life. But reports of neurogenesis in the adult human brain were sparse and had not been replicated. Moreover, the experiments had relied primarily on autoradiography, which revealed images of cell division but did not follow the fate of new cells, so researchers couldn’t be sure if they really became mature neurons. Gage’s group, which included clinicians, was familiar with the use of bromodeoxyuridine (BrdU) to monitor the progression of certain cancers. BrdU is an artificial nucleoside that can stand in for thymidine (T) during DNA replication. As cells duplicate their genomes just before they divide, they incorporate BrdU into their DNA. To assess tumor growth, physicians inject the nucleoside substitute into a patient’s bloodstream, then biopsy the tumor and use an antibody to stain for BrdU. The number of BrdU-labeled cells relative to the total number of cells provides an estimate of how quickly the cancer is growing. “If that nucleotide is labeled in such a way that [we] can identify it, you can birthdate individual cells,” Gage says. Because BrdU goes everywhere in the body, Gage and his colleagues figured that in addition to labeling the patients’ tumors, the artificial base would also label the cells of the brain. If the researchers could get their hands on brain specimens from patients who’d been injected with BrdU, perhaps it would be possible to see new brain cells that had been generated in adults. With a second antibody, they could then screen for cell-type markers to determine if the new cells were mature neurons. “If you can . . . [use] a second antibody to identify the fate of a cell, then that’s pretty definitive,” Gage says. Fifteen years later, in 2013, the field got its second (and only other) documentation of new neurons being born in the adult human hippocampus—and this time learned that neurogenesis may continue for most of one’s life.2 Neuroscientist Jonas Frisén of the Karolinksa Institute in Stockholm and his colleagues took advantage of the aboveground nuclear bomb tests carried out by US, UK, and Soviet forces during the Cold War. Atmospheric levels of 14C have been declining at a known rate since such testing was banned in 1963, and Frisén’s group was able to date the birth of neurons in the brains of deceased patients by measuring the amount of 14C in the cells’ DNA. But many details remain unclear. 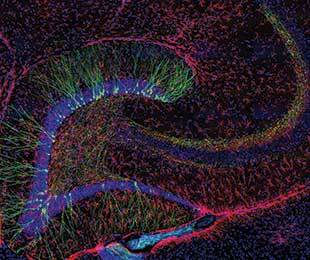 How do newly generated neurons in adults influence brain function? Do disruptions to hippocampal neurogenesis play roles in cognitive dysfunction, mood disorders, or even psychosis? 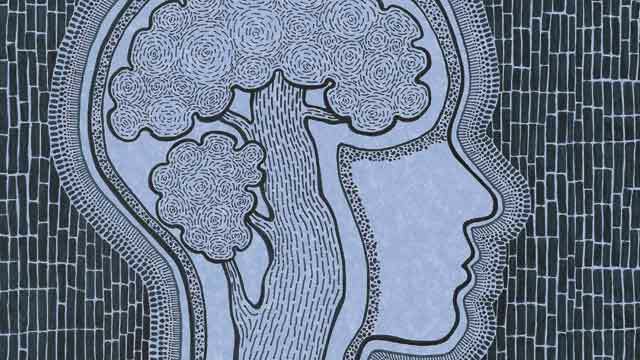 Are there ways to increase levels of neurogenesis in humans, and might doing so be therapeutic? Researchers are now seeking to answer these and other questions, while documenting the extent and function of adult neurogenesis in mammals. 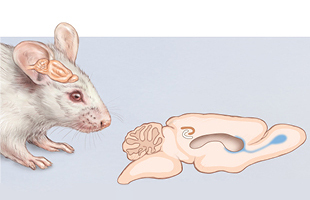 RODENT NEUROGENESIS: In rodents, there are two populations of neural stem cells in the adult brain. The majority of new neurons are born in the subventricular zone along the lateral ventricle wall and migrate through the rostral migratory stream (RMS) to the olfactory bulb. 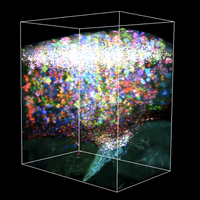 About one-tenth as many new neurons are produced in the subgranular zone of the dentate gyrus (white) of the hippocampus. Those new techniques included BrdU, as well as neuron-specific protein markers and confocal imaging, which together enabled researchers to identify the newly generated cells. Multiple studies subsequently confirmed that neurogenesis occurs in limited regions of the rodent brain, specifically in the olfactory bulb and the dentate gyrus region of the hippocampus. (See illustration.) Research also revealed that the rate of neurogenesis decreases with stress, depression, and anxiety, but increases with exercise and enrichment. HUMAN NEUROGENESIS: Researchers have also demonstrated that neurogenesis occurs in the adult human brain, though the locations and degree of cell proliferation appear to differ somewhat from rodents. “The field grew enormously at this point,” Gage says, and its focus began to shift from whether new neurons were being produced—they were—to whether those cells formed connections with existing networks to become functional—they do. Turns out, “these newly born cells have 5,000 synapses on their dendrites,” Gage says—well within the range of other neurons in the brain. But would those rodent results hold up in primates? All signs pointed to yes. In March 1998, Princeton University’s Elizabeth Gould and colleagues found evidence of neurogenesis in the dentate gyrus of adult marmoset monkeys—and the researchers determined that the rate of cell proliferation was affected by stress, just as in rodents.4 Six months later, Gage’s group published its findings based on the clinical samples of human brain tissue. “It was a surprise to me, and I think to most people,” Frisén says. And the point was hammered home with the Frisén group’s analysis of 14C in human brain samples. To determine the functional role of the new, hyperactive neurons, researchers began inhibiting or promoting adult neurogenesis in rodents by various means, then testing the animals’ performance in various cognitive tasks. 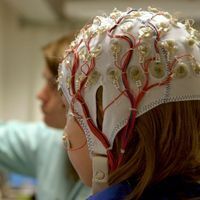 What they found was fairly consistent: the young neurons seemed to play a role in processing new stimuli and in distinguishing them from prior experiences. For example, if a mouse is placed in a new cage and given time to roam, then subjected to a mild shock, it will freeze for about 40 seconds the next time it is placed in that same environment, in anticipation of a shock. It has no such reaction to a second novel environment. But in an enclosure that has some features in common with the first, fear-inducing cage, the mouse freezes for 20 seconds before seemingly surmising that this is not the cage where it received the initial shock. 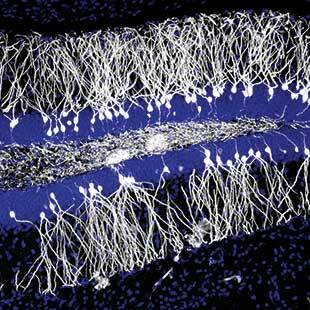 Knock out the mouse’s ability to produce new neurons, however, and it will freeze for the full 40 seconds. The brain is not able to easily distinguish between the enclosures. COURTESY OF FRED H. GAGE JASON SNYDER NEWBORN PHOTOS: Three different micrographs show new neurons (top and bottom, green; middle, white) generated in the adult mouse brain. 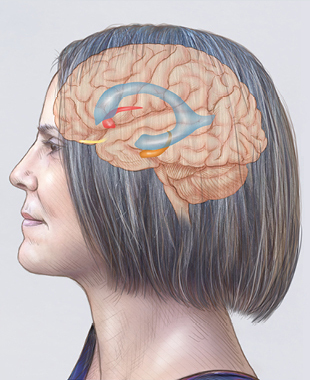 Neurogenesis occurs in the dentate gyrus, a V-shape structure within the hippocampus. Bushy dendritic processes extend into a relatively cell-free region called the molecular layer (black in bottom photo) and axons project to the CA3 region of the hippocampus (green “stem” in bottom photo). Astrocytes are stained pink (top).COURTESY OF FRED H. GAGEThis type of assessment is called pattern separation. While some researchers quibble over the term, which is borrowed from computational neuroscience, most who study hippocampal neurogenesis agree that this is a primary role of new neurons in the adult brain. “While probably five or six different labs have been doing this over the last four or five years, basically everybody’s come to the same conclusion,” Gage says. 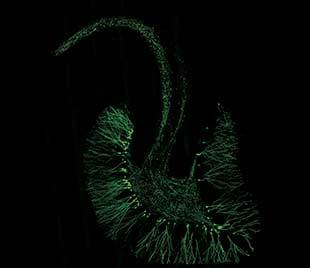 Pattern separation is likely not the only role of new neurons in the adult hippocampus. Experiments that have suppressed neurogenesis in adult rats have revealed impairments in learning in a variety of other tasks. 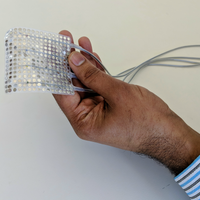 More broadly, “we think it has to do with the flexibility of learning,” says Gerd Kempermann of the Center for Regenerative Therapies at the Dresden University of Technology in Germany. And if it’s true that hippocampal neurogenesis does contribute to aspects of learning involved in the contextualization of new information—an ability that is often impaired among people with neurodegenerative diseases—it’s natural to wonder whether promoting neurogenesis could affect the course of Alzheimer’s disease or other human brain disorders. Epidemiological studies have shown that people who lead an active life—known from animal models to increase neurogenesis—are at a reduced risk of developing dementia, and several studies have found reduced hippocampal neurogenesis in mouse models of Alzheimer’s. But researchers have yet to definitively prove whether neurogenesis, or lack thereof, plays a direct role in neurodegenerative disease progression. It may be that neurogenesis has “nothing to do with the pathology itself, but [with] the ability of our brain to cope with it,” says Kempermann. P.S. Eriksson et al., “Neurogenesis in the adult human hippocampus,” Nat Med, 4:1313-17, 1998. K.L. Spalding et al., “Dynamics of hippocampal neurogenesis in adult humans,” Cell, 153:1219-27, 2013. J. Altman, “Are new neurons formed in the brains of adult mammals?” Science, 135:1127-28, 1962. 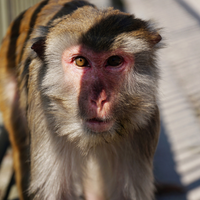 E. Gould et al., “Proliferation of granule cell precursors in the dentate gyrus of adult monkeys is diminished by stress,” PNAS, 95:3168 -71, 1998. C. Schmidt-Hieber et al., “Enhanced synaptic plasticity in newly generated granule cells of the adult hippocampus,” Nature, 429:184-87, 2004. S. Ge et al., “A critical period for enhanced synaptic plasticity in newly generated neurons of the adult brain,” Neuron, 54:559-66, 2007. M. Bergami et al., “A critical period for experience-dependent remodeling of adult-born neuron connectivity,” Neuron, 85:710-17, 2015. K. McAvoy et al., “Rejuvenating the dentate gyrus with stage-specific expansion of adult-born neurons to enhance memory precision in adulthood and aging,” Soc Neurosci, Abstract DP09.08/DP8, 2014. K.G. Akers et al., “Hippocampal neurogenesis regulates forgetting during adulthood and infancy,” Science, 344:598-602, 2014. L. Santarelli et al., “Requirement of hippocampal neurogenesis for the behavioral effects of antidepressants,” Science, 301:805-09, 2003. A. Besnard, A. Sahay, “Adult hippocampal neurogenesis, fear generalization, and stress,” Neuropsychopharmacology, doi:10.1038/npp.2015.167, 2015.